Want a beautiful honeymoon in Bora Bora? Here are the choices you have for your Bora Bora Honeymoon. 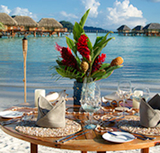 Choose or design the perfect Tahiti honeymoon package especially for you. 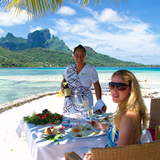 Look for the special Bora Bora Honeymoon packages that are always on offer. They are valid for travel during a specific time period. (Elope if necessary!) Air Tahiti has some good ones. and an upgrade to a Deluxe Over water Villa in Bora Bora. 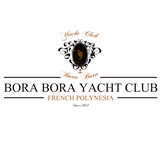 Currently there are no Bora Bora all inclusive resorts as Club Med Bora Bora has closed without any hint of re-opening. 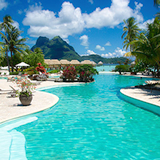 It is still possible to do a Bora Bora all inclusive vacation. See our informative Bora Bora Vacation page for planning ideas and money saving tips including why it is essential to buy a meal plan when you book your resort. 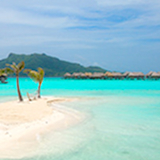 Here you can find out what complimentary activities the Bora Bora resorts do provide. 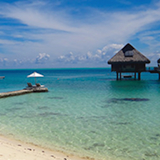 If a honeymoon in Bora Bora has always been your dream and you don't have the money for Bora Bora honeymoon resorts right now, Paul Gauguin cruises give a superb Tahiti vacation all inclusive with a stop in Bora Bora. Until I had the experience myself I had no idea how fantastic Tahiti luxury cruises can be and now I'm completely sold. 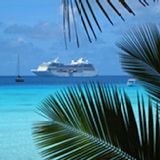 If you cruise Princess, Tahiti, you have a 2 day stop in Bora Bora and can dine at the back of the ship with dramatic Bora Bora Island so close it feels as if you can reach out and touch it's exotic greenery. Perhaps you would like to visit some other unique French Polynesian islands to make the most of your honeymoon in Tahiti. You can source some of the best ideas on our honeymoon vacation Tahiti page.